Brown says VW needs to sell 500,000 units annually for a healthy U.S. dealer network. Volkswagen dealers have had enough. Promises of 800,000 sales never came true. Eurocentric product planning created a car-heavy lineup in the U.S. market, where crossovers are king. The diesel emissions scandal has dented business and soured customer sentiment. The abrupt departure of Michael Horn, who was CEO of VW of America, on March 9 seemed to be the last straw for VW dealers, many of whom felt they had lost their only champion with the clout to get things done at company headquarters in Wolfsburg, Germany. Horn's exit set Alan Brown, chairman of the Volkswagen National Dealer Advisory Council, into action. The council issued a stern press release denouncing Horn's departure, while talks of class-action lawsuits began to gain steam from elsewhere in VW's dealer network. To head off a mutiny, Brown and two others on VW's dealer council brought their concerns directly to VW, meeting with global brand chief Herbert Diess, newly appointed North America chief Hinrich Woebcken, global sales boss Juergen Stackmann and North America sales boss Ludger Fretzen. Now, Brown, 44, says VW needs to sell 500,000 units annually for a healthy dealer network. Brown, who is general manager and partner of Lewisville Volkswagen near Dallas, spoke with Staff Reporter Ryan Beene. Q. You recently met with VW executives in Germany. What was the purpose of that meeting? A. The agenda of the meeting in Germany was to really settle in and prepare this new leadership for NADA. This new leadership team in Dr. Diess, Mr. Stackmann and Mr. Woebcken, they want to win. They want to make their mark, and they see it as a great opportunity to make their mark because all of the leadership prior to this has been ineffective in the U.S. market. The core of the conversation was very simple: 330,000 units does nothing but lose Volkswagen a ton of money and puts the dealer at about half of NADA [guidelines] on return on sales. It's a train wreck for both of us. Volkswagen AG has made this great investment in the last seven years. The dealer network has made this great infrastructure investment in the last seven years, and we're both looking at each other saying "this ain't working." We're going to have to be in that 450,000 to 500,000 unit range as a new baseline that we build from. Did the executives commit to a 2016 U.S. sales target? No. We're just trying to hit the reset button as fast as we can. All of the things we discussed were more open-ended so that they could hit NADA with more specifics and quality content. That's what we're very hopeful about. Dr. Diess was not coming to NADA. Halfway through our private discussion in Wolfsburg, he decided he was coming and changed his entire schedule to come to NADA and present along with Mr. Woebcken. I saw that as a huge opportunity for them to put their best foot forward and talk about the difficult subjects in the room with pricing strategy and how do we hit the reset button in 2016 with the product that we have to get off of this 330,000-unit cadence. Did you ever imagine when the EPA announced the emissions violations on Sept. 18 that you'd be sitting here more than six months later without any details on a fix? Absolutely not. I figured we would have not only the fix in the public but a good majority of the public satisfied. What has VW said the holdups have been? From my vantage point, it has changed a lot over the last three or four weeks. I get most of my news on this from the media and from you guys. [VW] has kept it that quiet even from me. Two months ago, stuff was coming out, and it was upsetting the opportunity to negotiate and close it up so they became very tight-lipped and very private. How is that affecting dealers' business? It has upset a lot of dealers. We worked so hard on positioning TDI to separate us from the market at a price point that separated us also from our premium competitors like BMW and Mercedes and Audi. Not having that product has affected the dealer network, and it continues to affect the dealer network. Sales, service, trade opportunity. It seems like if someone owns a TDI, they are just kind of stuck in this place. They're trying to not spend a lot of money on their maintenance. They're not in a position to trade and not in a position to make a decision about doing anything because they're waiting on finding out what VW and what the EPA are going to do about the car. Is the car deemed undriveable by the EPA? Is the EPA going to allow a software reflash? If so, is it going to affect performance? If it affects performance, how is Volkswagen going to take care of each one of these clients based on the fact that they've been duped? It is just this 18-layer cake. I would have thought we'd be working through solutions for fixing customers' cars, but obviously if you cheated the emissions deal for this amount of time, I guess this is why you did it because there is no clear remedy operationally or designwise. How disappointing is that for you and other dealers who have invested so much money and time in this franchise? It's very disappointing and very concerning. It's also why you saw in our press release that we also talked about the pink elephant in the room. I encouraged Volkswagen to think of a strategy for how they're going to approach the dealer network on franchise damages. Obviously, that's the pink elephant in the room but I encouraged them that the dealer network has a great heart, or they would have sued you already. They haven't because they want to work through this, but at some point we've got to address the layers of things that this thing has affected from the dealer's ability to operate and do business with its core TDI message. For our California stores, it's literally 45 to 50 percent of their business. We're going to have to get to that place in time where we sit down with the dealers, I believe, and have a business conversation when it comes to franchise values and interruption of business. You're talking about reparations or a settlement package, correct? That's what I would encourage them to look at when the time is right. Correct. How much money could we be talking about? I have yet to really dive into it deep with the voices in the network so I wouldn't want to speak on their behalf without having some more information. I think a great starting point would be the discretionary funds. VW very scientifically determined what dealer got what. I think that's probably a great mathematical starting point. You take that and multiply it out by whatever number of years you think it has affected not only today but in the future. I think some form of mathematical figure there is probably a great starting point. That could be millions of dollars per dealer, no? It just depends on what the average dealer is getting. If an average dealer is getting $20,000 a month in discretionary money, that's $240,000 per year. If they deem this to be a four-year process, that's going to be just south of $1 million for that particular dealer. I can tell you this: When you're asked, "Is there an example of damages?" Yes, there is. There was a dealer in Chicago who was in the middle of a buy-sell that was actually backed up after the EPA announcement, and I believe that particular dealer was about 2.2 in [blue-sky multiple] and doing well with the building, land and fixtures on the inside. There are some real documented cases out there where you can honestly say "I was troubled by being put in the middle of this." I think the total cost of the transaction was over $6 million between building and land and that sort of thing. When you brought that up in the meeting, what was the reaction of Diess and VW's other executives? They're concerned. At the end of the day, in this situation they're getting hit from every single angle. First of all, we want to be good partners through this process, but at some point the dealer network is going to want to have this discussion, and that's why toward the end of our meeting we brought it up, and that's why it was also part of the newsletter that went out. Yeah, I wouldn't say that they had much to say. I would say there was a lot of note-taking. 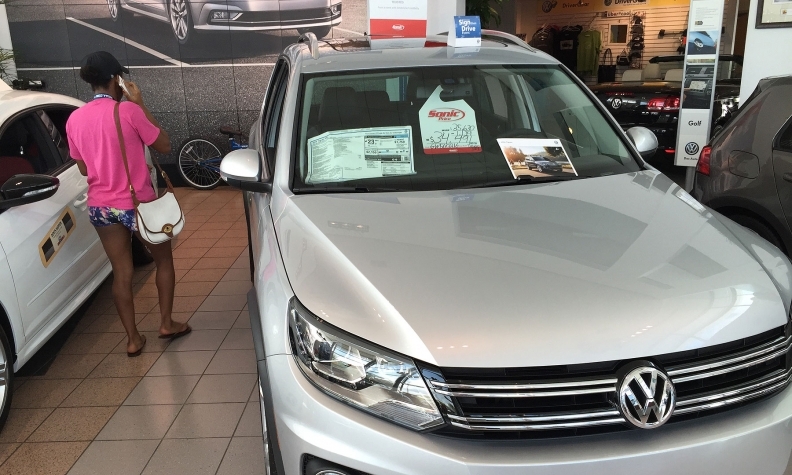 If VW doesn't come through with a reparations package, will dealers sue? It's hard to say. I think the dealer network has been through an awful lot when you add it all up. Between VW not really honoring their word with volume strategy, then the EPA mess, and clock-spring and camshaft [recalls] and now we're fighting the airbag deal. It's like we just can't catch our breath right now. I don't think that there's a dealer in America that's faced as much adversity at one time as a VW dealer. That's why we brought it up. We were asked to bring it up. Are VW dealers getting ready to throw in the towel if these issues aren't resolved? I think we're a pretty resilient group of people. I don't know if we'd give up pretty easily based on the cadence that we've had so far. We want to get to the other side of getting all of this fixed. It's wearing us all thin, including the factory guys. We just can't get our footing in anything. As far as throwing in the towel, we can't afford to. We've got more than $1 billion invested in America. Failure is not an option. It's not an option for [VW] AG, and it's not an option for the dealer network. There has been a lot of management turnover at VW both in Germany and in the U.S. How are relations with U.S. headquarters in Herndon, Va., and with Germany? Mark McNabb does a fine job. Vinay Shahani does a great job in marketing. I think we've got some really good people in Herndon, and we talked about making sure we put our arms around these people because they've had to work a whole lot harder than probably what they thought they were signing up for. My prayer would be that Mr. Woebcken spends the amount of time that he needs to learn his team and work with the team that's there and lead them. He's that kind of guy. He seems very kind-hearted. He seems very sharp. He doesn't seem like he's afraid to make a decision or afraid to take a calculated risk. So it does feel like, with autonomy that AG should be giving him, we should be able to do some big things and do some big things quickly. What was your reaction when you learned that Michael Horn had left the company? Shocked, worried, concerned, frustrated. He had a lot of stock in us, and we had a lot of stock in him. That's another layer of distraction in Herndon, for [the dealer council] and for myself as chair. That's a tough thing to navigate, and you got all the frustration from the dealer network, or at least I did. That's why we went to the media and expressed the tone of what we were really facing in light of Michael Horn's departure and at the same time what Dr. Diess' first comments were at the Detroit auto show. Both of them, in our eyes, were not putting us in the right position. How much time have you spent with Hinrich Woebcken? I started having phone conversations with him before I went to Germany. I spent pretty much the better part of March 15 and the better part of the second half of the day on March 16 with him. Since then, he and I talk pretty much every single day, either on the phone or by text. He called me with excitement today because he got to drive the B-SUV in California for the first time. He is fully excited about where we're going and the challenges before us, and that's infectious. He's competitive, and he wants to win. What has Woebcken identified as the keys to VW's U.S. strategy? What will he bring to the table compared with Horn? That's what we're really going to hear and understand for the first time at NADA. In our sidebar conversations with him, it's very simple: we've got to have as much control of our infrastructure in Canada, the U.S. and Mexico as possible. Us waiting for Europe to give us extra Tiguans when they get done taking all the ones they want must be a thing of the past. That's what's gotten us into trouble in our previous life. The U.S. market was always an afterthought. If they're really going succeed, the U.S. market has to be a pillar. VW has talked about hitting the reset button in the U.S. market once every few years. Why should dealers believe that this time is for real? That's the same question I asked. It's three words: Honor your word. Like I told Mr. Woebcken and Dr. Diess and Mr. Stackmann - I said: "Guys, don't take this the wrong way. I'm not saying it to you personally. But the word is no good at AG." If we're going to run a business, we've got to start doing what we say we're going to do. That's why there was such a deflate when Michael Horn was let go. We finally felt like we had a guy fighting for us and not bullshitting us. We felt like we had some good products coming. That's why we didn't sue and go after a class action up until this point because we felt like he was really getting us the future product to get us back on track. We've just got to be truthful with one another. I will tell you that Mr. Woebcken, Dr. Diess and Mr. Stackmann all responded very well to that. They understand that they have to get some fast wins and some long-term strategy that actually comes together in a timely fashion because we've been neglected and not actually cared for for a long time. The good news is that sentiment turns around very quickly when you do what you say you're going to do. What have VW's executives said or done to give you faith that this time is different? I'm showing up at NADA, and we're going to talk about it. The first moment of faith was when Dr. Diess in our meeting changed directions and said, "I'm going to be there." Horn in January said VW would be lucky to post flat sales in 2016. What would that mean for dealers who have already suffered through three years of falling sales? 330,000 units is not going to produce a good result for Volkswagen AG, and it's not going to produce a good return on sales against NADA [guidelines] for the network. That's obvious. That's why part of what we pushed really hard for have been short-term gains. How can we improve Passat sales? How can we take some more Beetle Classics? Those cheaper Beetles turn really quickly. We need more of that product. How can we take on more Tiguans and not let off the incentives we're doing so that we keep that product moving well against [Honda] CR-V and [Toyota] RAV4? A lot of our discussions were not about how we are going to batten down the hatches and stay at 330,000. The discussions were about how we are going to make calculated, correct moves to get as much above 330,000 as humanly possible. Do you think that's likely to happen this year? Yes. I think it's imperative. We've got to get going here. Passat's a great example. We know the volumes that Toyota Camry is doing. It just boils down to: What do we need? Is it another $1,000 or $2,000 - what's going to be the tipping point that gets us moving again in that segment? The good news is when we get the hot hand, Chattanooga can spit them out like Lay's Potato Chips. Hopefully we hear about it at NADA and, more importantly, we see it shortly after in bold moves.